The Canberra was designed in English Electrics famous 'garage' design office in Corporation Street, Preston. In its first 10 years of service it broke 19 flight records and 3 altitude records. It sold to Air Forces all over the world including the USAF. A total of 1347 built, 925 in the UK. The photograph above is taken from the book 'English Electric Aircraft and their Predecessors' by Stephen Ransom and Robert Fairclough, Putnam Press ISBN 0 85177 806 2 first published 1987. 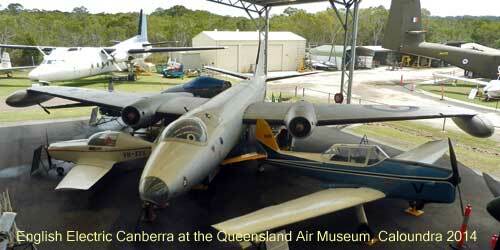 It is a Canberra T Mk4 which first flew in June 1952. This aircraft was designed by W.E.W Petter who joined English Electric at Preston in 1944 and immediately started work on his ideas for a high altitude jet bomber. An aside; a member of the BAE SYSTEMS North West Heritage Group told me that Petter's office table was used by the Chief Test Pilot at Warton until very recently and it is now in their care. The first flight was Friday 13th May 1949. With Roland Beamont as test pilot. The aircraft was VN799. Following a spectacular display at Farnborough in 1949 the USAF and RAAF became seriously interested in obtaining the aircraft. 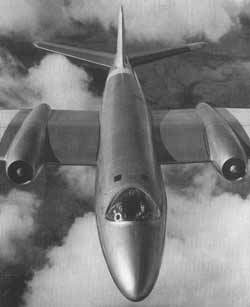 From being a 'shadow' aircraft manufacturing company during the war English Electric became a major design company and the Canberra was multi-sourced from several of the UK's established aircraft manufacturers. Another major contributor to its success was the Rolls Royce Avon engine that was developed for the aircraft at RR Barnoldswick. The aircraft entered operational RAF squadron service on 25th May 1951 and is still in service today 53 years later. First aircraft to fly across the Atlantic in both directions in one day. First aircraft to fly from the UK to Australia in under 24hrs, actually 22hrs. First aircraft to exceed 60,000ft and 70,000ft altitude. One of 5 Canberras at Newark Air Museum, this one was made at Short Brothers, Northern Ireland. May 13 2009 is 60 years since the first flight. Good article in May 2009 Aircraft Illustrated. The Times reports that Sir Geoffrey Dhenin died on 6th May 2011 at the age of 93. An RAF doctor who also obtained pilots wings. In October 1953 he piloted a Canberra through a radioactive cloud 6 minutes after the bomb had been detonated at Woomera in Australia. During the flight radioactive samples were taken in pods fitted to the aircraft wings. The pods were dropped in a safe area before landing. He was awarded the Air Force Cross for this flight. He later received a bar on this award for further flights in 1957 sampling radioactivity from the bombs detonated at Christmas Island. During the war he received the George Medal for rescuing a gunner from a blazing plane. The RAAF purchased Canberra and built them in the Government Aircraft Factory in Melbourne. Photo below is at the Queensland Air Museum (QAM), Caloundra. GAF built Canberra Mk20 A84-225. It was the 25th built at the Avalon factory and was completed in October 1955 and delivered in May 1956 after some rectification. It last flew in November 1970 with 3395hrs 15mins flying time. This item is QAM Exhibit Number 1 being bought in 1973 and unveiled in 1974. Good museum worth a look, an F111 is the main exhibit and an interesting display about Air Vice Marshall Don Bennett a brilliant airman and Queenslander who set up and led the RAF Pathfinder force. Another display is a Hawker Hunter built at Squires Gate Blackpool. 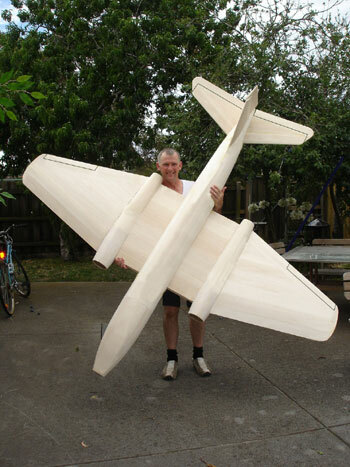 Gerald Stewart of Melbourne was building a flying model. Here is the latest photo (Dec 06) of the airframe prior to fitting out. An RAAF?Canberra is also on display in the Queensland Air Museum at Caloundra. May 11, 2007 - The Indian Air Force ended flying the Canberra - 106 Sqn at Agra. The aircraft was in service for 50yrs, since 1957. More here at Flight Global.